I woke up this morning feeling horrible and thank God my friend was able to cover for me at the gym....my tonsils are super swollen, I am stuffed up and feel run down. I had an "ah ha moment" today when I was walking back from the supermarket with my "green" bags over flowing with groceries. I looked across the street and there was a line of people about a block long waiting for free food at a local spiritual center. At that moment I realized how blessed I am for everything I have. What was your "ah ha moment"? 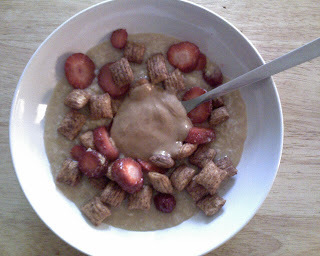 I just finished eating bfast which was kashi oatmeal (ironically the name of the spiritual center), cinnamon puffins, chopped strawberries, and TJ's almond butter and my usual coffee. I know what you mean about feeling fortunate. On my way to work a few weeks ago, I passed a long line of people (probably a few hundred). It turns out they were standing in line for a job fair! Feel better soon! I have my moments when I see people begging for money at the train station. Now I look around at my home and realize how lucky I truly am. I hope you feel better and the allergy monster let's you off the hook! I had an "ah ha" moment at church yesterday; I'm always stressing about money, we have enough but not to save up for a house or anything we'd "like" and then I listened to stories of people at church who've lost their jobs, are losing insurance coverage and some of them having to use government aid to buy groceries for their children. It broke my heart and I realized just how blessed I really am.